RIO DE JANEIRO: Brazilians cried, cursed their president and covered their faces in shame after their beloved football team's humiliating 7-1 thrashing by Germany in the World Cup semi-finals Tuesday. After the fifth goal, well before half-time, hundreds of people left their expensive seats at the stadium in the southeastern city of Belo Horizonte. A section of the crowd chanted sexually expletive obscenities against the players and President Dilma Rousseff, who during the cup had mostly enjoyed a reprieve from protests over the record US$11 billion spent to host the tournament. The tears began well before the final whistle, with the third German goal in the first half causing children and adults to start balling in the stadium and in public screenings across the continent-sized nation. As people streamed out, police reinforced security inside and around the stadium. Others around the country shouted at their televisions and abandoned public screenings. As the goals kept going in, a downpour only added to the already gloomy mood of thousands of fans in Brazil's canary-yellow jersey at the official "Fan Fest" on Rio de Janeiro's Copacabana beach. Two dozen fans scuffled, forcing police to intervene. Brazilians were already concerned about the team's chances after their superstar forward Neymar broke a vertebrae in the quarter-final victory over Colombia. But they never thought it would be this bad. "This is a terrible match and Brazil without Neymar are terrible. I hate this match. It's embarrassing to lose like this," said Beth Araujo, 24, a biology student. "The only good thing is I think it will affect President Dilma in the election. But all our politicians are even worse than the team," she said. Rousseff said she was "very sad" and "sorry" about the result. Brazil had hoped to exorcise the ghost of its defeat to Uruguay in the 1950 World Cup final in Rio de Janeiro, a national trauma dubbed the "Maracanazo" because it was played in the Maracana Stadium. This time, TV commentators were talking of the "Mineirazo," after the Mineirao Stadium. But Jessica Santos, a 23-year-old photo student, was taking the massacre in stride. "The cup is back in Brazil for the first time in 64 years so of course we'll cheer until the end," she said. "If Brazil wins, we party, if Brazil loses, we still party. It would have been worse to lose to Argentina in the final." 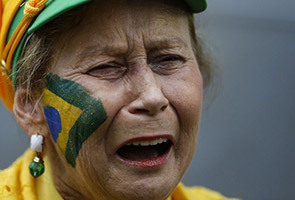 At a popular night district of Sao Paulo, fans shouted insults at goalkeeper Julio Cesar and other players. "I was afraid we would lose because we were without Neymar and Thiago Silva. But I never thought it would be a massacre," said Alexa Rosatti, 19, a university student. "I stopped watching for a second and they already had scored a sixth goal." The insults against Rousseff, who is seeking re-election in October, showed that tensions remain following massive demonstrations that rocked the country last year when Brazilians demanded better health care and education. Some Brazilians have voiced concerns that Brazil's failure to win the World Cup could spark more protests and clashes. "It's a disaster. It will be chaos. People will break everything. They're going to be furious," said Karina Marques, a 17-year-old footballer who watched the game at a street screening in Rio attended by 30,000 people. "The government spent a lot of money for this World Cup instead of investing in health and education."